← January 17, 1861: Orr to the Georgia Convention: North in the grip of a “blind and relentless fanaticism”. The Georgia Secession Convention opened on January 16, 1861, but the first two days were largely taken up by formalities. On January 18 the convention got down to the main business at hand. Resolved, That in the opinion of this Convention, it is the right and duty of Georgia to secede from the present Union, and to co-operate with such of the other States as have or shall do the same, for the purpose of forming a Southern Confederacy upon the basis of the Constitution of the United States. Resolved, That a committee of be appointed by the Chair to report an ordinance to assert the right, and fulfill the obligation of the State of Georgia to secede from the Union. These resolutions passed by a vote of 166 to 130. 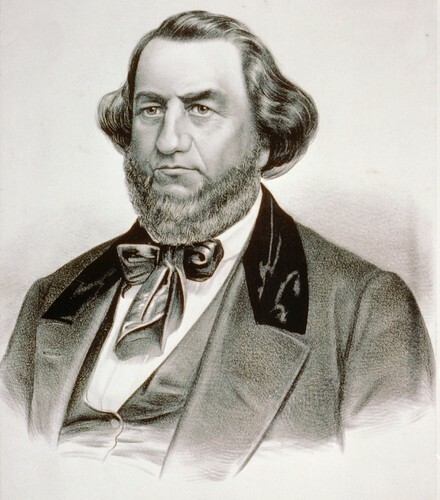 Before they were passed, there was considerable debate over a substitute resolution had offered by Herschel V. Johnson (Stephen Douglas’ running mate), which would have delayed secession and suggested constitutional amendments that could keep Georgia in the Union. Johnson’s view, as expressed earlier, was one of caution. His proposed substitute resolution is informative mainly because it makes clear the objections the convention had to the Lincoln administration. The State of Georgia is attached to the Union, and desires to preserve it, if it can be done consistent with her rights and safety; but existing circumstances admonish her of danger: that danger arises from the assaults that are made upon the institution of domestic slavery, and is common to all the Southern States. From time to time, within the last forty years, Congress has attempted to pass laws in violation of our rights, and dangerous to our welfare and safety; but they have been restrained by the united opposition of the South and the true men of the North, and thus far the country has prospered, and the South has felt comparatively secure. Recently, however, events have assumed a more threatening aspect, several of the non-slaveholding States refuse to surrender fugitive slaves, and have passed laws the most oppressive to hinder, obstruct and prevent it, in palpable violation of their constitutional obligations. The Executive Department of the government is about to pass into the hands of a sectional, political party, pledged to principles and a policy which we regard as repugnant to the Constitution. These considerations, of themselves, beget a feeling of insecurity which could not fail to alarm a people jealous of their rights. By the regular course of events, the South is in a minority in the Federal Congress, and the future presents no hope of a restoration of the equilibrium between the sections, in either house thereof. Hence the Southern States are in imminent peril, being in the power of a majority, reckless of constitutional obligations, and pledged to principles leading to our destruction. This peril is greatly augmented by the recent secession of South Carolina, Florida, Alabama and Mississippi from the Union, by which the Southern States are deprived of the benefit of their co-operation, and left in a still more hopeless minority in the Federal Congress. Therefore, whilst the State of Georgia will not and cannot, compatibly with her safety, abide permanently in the Union, without new and ample security for future safety, still she is not disposed to sever her connection with it precipitately, nor without respectful consultation w4th her Southern confederates. She invokes the aid of their counsel and co-operation, to secure our rights, in the Union, if possible, or to protect them out of the Union if necessary. First. Be it ordained by the State of Georgia in sovereign Convention assembled that Delaware, Maryland, Virginia, Kentucky, North Carolina, Louisiana, Texas, Arkansas, Tennessee and Missouri, be, and they are hereby respectfully invited to meet with this State by delegates in a Congress, at Atlanta, Georgia, on the 16th of February, 1861, to take into consideration the whole subject of their relations to the Federal Government, and to devise such a course of action as their interest, equality and safety may require. Section second. Be it further ordained, etc., That the independent Republics of South Carolina, Florida, Alabama and Mississippi, be, and they are hereby cordially invited to send Commissioners to said Congress. 1. That Congress shall have no power to abolish or prohibit slavery in the territories or any place under their exclusive jurisdiction. 2. Each State shall be bound to surrender fugitive slaves, and if any fugitive slave shall be forcibly taken or enticed from the possession of any officer legally charged therewith for the purpose of rendition, the United States shall pay the owner the value of such slave, and the county in which such rescue or enticement may occur, shall be liable to the United States for the amount so ]3aid to be recovered by suit in the Federal Courts. 3. It shall be a penal offence definable by Congress and punishable in the Federal Courts for any person to rescue or entice, or to encourage, aid or assist others to rescue or entice any fugitive slave from any officer legally charged with the custody thereof, for the purpose of rendition. 4. Whatever is recognized as property by the Constitution of the United States shall be held to be property in the Territories of the United States, and in all places over which Congress has exclusive jurisdiction, and all kinds of property shall be entitled to like and equal protection therein by the several departments of the general government. 5. New States formed out of territory now belonging to the United States, or which may be hereafter acquired, shall be admitted into the Union with or without slavery as the people thereof may determine at the time of admission. 6. Congress shall have no power to prohibit or interfere with the slave trade between the States, nor to prohibit citizens of the United States passing through, or temporarily sojourning in the District of Columbia from having with them their slaves, and carrying them away, but it shall be the duty of Congress to provide by law for the punishment of all persons who may interfere with this right in the same way as is provided for in the foregoing third proposition. 7. No State shall pass any law to prohibit the citizens of any other State travelling, or temporarily sojourning therein, from carrying their slaves and returning with them; and it shall be a penal offence, definable by Congress, and punishable by the Federal Courts, for any person to entice away, or harbor, or attempt to entice away or harbor, the slave or slaves of such citizen so travelling, or temporarily sojourning. 8. The obligation to surrender fugitives from justice as provided for under the Constitution of the United States extends, and shall be held to extend as well to fugitives charged with offences connected with or committed against slavery or slave property as to any other class of offences, and for the purposes of this proposition, whatever is defined to be a criminal offence in one State shall be deemed and held a criminal offence in every other State. 9. The Supreme Court having decided that negroes are not citizens of the United States, no person of African descent shall be permitted to vote for Federal Officers, nor to hold any office or appointment under the government of the United States. Section fourth. Be it further ordained, etc., That refraining from any formal demand upon those slaveholding States which have passed them, of the repeal of the personal liberty and other acts, in any wise militating against the rendition of fugitive slaves, or fugitives from justice, yet the State of Georgia hereby announces her unalterable determination not to remain permanently in confederation with those States, unless they shall purge their statute books of all such acts. Section fifth. Be it further ordained, etc., That if, between now and the time of final action upon the question of her continuance in the Union, the general government should attempt to coerce any one of the States that have recently withdrawn, or shall hereafter withdraw therefrom, the State of Georgia will make common cause with such States, and hereby pledges all her resources for their protection and defence. Section sixth. Be it farther ordained, &c, That the State of Georgia will continue to hold, until her final decision in the premises, the possession of Fort Pulaski, and all other Federal property within her borders, which have been seized under the direction and authority of His Excellency the Governor of this State. Section seventh. Be it farther ordained, &c. That a Commissioner be appointed by this Convention to each of the slaveholding States, now members of the Federal Union, to inform them of th e action of Georgia, and to urge their conformity to the policy herein indicated, and that in response to the request of Alabama, this Convention will also appoint a Commissioner to the Convention, which she has invited at Montgomery on the 4th of February next, who is hereby instructed to urge upon that Convention so to shape their action as to conform to, and cooperate with, that of the proposed Congress at Atlanta, on the 16th day of the same month. Section eighth. Be it further ordained, &c., That if all effort fail to secure the rights of the State of Georgia in the Union, and she is reluctantly compelled to resume her separate independence, she will promptly and cordially unite with the other Southern States similarly situated, in the formation of a Southern Confederacy upon the basis of the present Constitution of the United States. Section ninth. Be it further ordained. That this Convention will adjourn, to meet again on the twenty-fifth day of February next, to take such action in the premises as may be required by the proceedings of the Congress at Atlanta, and the development of intervening events, keeping steadfastly in view the rights, equality and safety of Georgia, and her unalterable determination to maintain them at all hazards, and to the last extremity. In essence, Johnson wanted to make secession contingent on the formation of a Southern Confederacy (he was a “cooperationist,” in the term of the time) and was willing to stay in the Union if the Crittenden Compromise was adopted. As always, even to the moderates, the issue was the preservation of slavery, and Johnson simply argued that secession was not necessarily required to preserve it. By a 166-130 vote, the Georgia convention rejected this conservative strategy and opted for unilateral secession. This entry was posted in Causes of the war, Crittenden Compromise, Georgia, Secession, Slavery. Bookmark the permalink.